Academics are busy, and outreach work can seem like another task to be added to an already long list of things to do. One way forward is to do outreach as ‘inreach’. 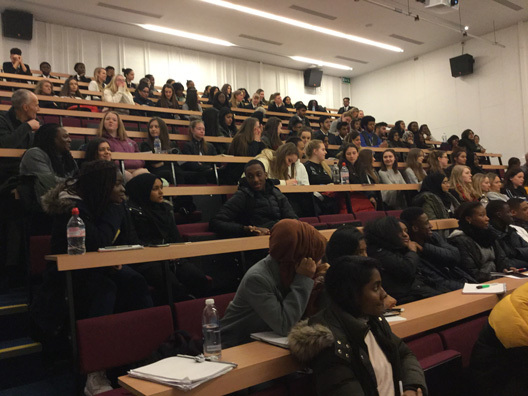 In May 2017, the Psychology Department at the University of Westminster launched Psych4Schools to encourage secondary school students to consider psychology as a subject choice at university. At the launch of this initiative, which I organised, 37 students from a North London secondary school for girls visited the department for mini-lectures, a psychology taster workshop and a Human Library. In February this year, encouraged by positive feedback from the students and staff at the girls school, Psych4Schools engaged with over 120 students and staff from four secondary schools, and from as far afield as Buckinghamshire. A proportion of students were from Black, Asian and Minority Ethnicity (BAME) backgrounds, marking our commitment to encourage diversity in accessing the discipline. One of the schools attending holds the title of a ‘Confucius Classroom’ because of its business links with China. Its (mainly BAME) students are also recipients of free lessons in Mandarin! This year’s event was opened by Professor Damien Ridge, Head of the Psychology Department, who welcomed the students and staff with an overview of the day. This was followed by several mini-lectures. Dr Haiko Ballieux, who is trained as a developmental cognitive scientist, introduced the topic of neuroplasticity in relation to multisensory integration. He demonstrated this by talking about the McGurk effect and by demonstrating the 'Rubber Hand' illusion with one of the students. He had students think about whether they thought their brains tricked them or whether they tricked their brains in both cases. Dr Samuel Evans, lecturer in cognitive psychology and honorary research associate, introduced students to exciting research into cochlear implants. He explained how the hearing system works and how cochlear implants can restore hearing. He also demonstrated what we can learn about typical hearing from simulations of cochlear implants and how we can study other kinds of groups, for example non-clinical voice hearers, using similar auditory techniques. The final presentation was given by principal lecturer and neuroscientist, Dr Catherine Loveday, whose taster session introduced students to her research on music and autobiographical memory, demonstrating the power that familiar songs have to take us back in time. She explained why music is thought to be such a powerful tool for connecting with other people. After lunch, the students experienced workshops that included a variety of memory experiments, some using psychology testing equipment (e.g. PowerLab, Cantab). Students also enjoyed producing spectrograms to analyse human voice recordings. As a parallel activity, students engaged in conversations in a Human Library setting, participating as ‘books’ or ‘borrowers’. Their book titles drew on memories for food, clothing or music. The event ended with a panel discussion. Several psychologists, including Chantal Gautier, an Occupational Psychologist and Senior Lecturer, told the student audience how they got into the discipline, with diverse roles such as working in the hotel industry, as a musician and as a dancer beforehand. There was advice on hand from the Outreach Team on producing a successful application to university, and students were encouraged to include their competences and voluntary experience to highlight their skills. As a bonus, students enjoyed tours of the campus. The Psychology Department continues to work in partnership with Education and Employers, Inspiring the Future and the Edge Foundation to deliver outreach/Inreach events. Monty Karmakharm (Schools Engagement Co-ordinator, Education and Employers) was key to securing contact with the schools. Our aim is to showcase the discipline of psychology by engaging with secondary schools across the country. The appeal of Psych4Schools indicates that this will continue to be a regular feature at the University of Westminster. - Deborah Husbands is a Senior Lecturer in Psychology at the University of Westminster.